Following a nice mention on the Environment blog of The Guardian a few days ago (thanks! ), I was invited this morning to [wake up super early and] chat with Fred MacAulay, host of BBC Scotland’s mid-day radio show. Apparently there has been a sudden interest in scaled-down home heating in the UK, a result of this photo published by The Telegraph showing the Queen receiving the Australian High Commissioner and his wife, while using a small space heater to warm up the room. It occurs to me that the Queen may really have been quite comfortable without any heat at all, and only got the electric heater out of the closet for the benefit of her antipodal, “it was a hell of a lot warmer at our house than here” guests. I know that’s how it works at our house. Anyway, if you’d like to have a listen, here’s the link. The segment begins at minute 20:00 with a local environmentalist, then me (halfway awake) about 25:00. We’re sandwiched between a bit about macaroni and cheese and the actual serious news. Which seems about appropriate. And, hello to all seven Scots who found this blog via the radio show! Come visit any time! Meanwhile, haven’t had any fire/heat on in here in 48 hours. A bit of sun, not-so-cold nights, some cooking, and the kitchen is still holding at 50F/10C. Not much news here at the Cold House. Apart from the blizzard (which I refuse to call “Nemo”) it’s been a fairly average winter, weather-wise. I’ve settled into a routine of small fires in the eves, none in the morning, the usual. With the sun inching higher each day it has become worthwhile opening the blinds on the south side of the house in the morning and closing them at night. A couple times already the house has been a few degrees warmer when I get home from work than it was when I left– a sure sign that winter’s grip has been broken. The downstairs overall-average temp since October has settled right around 52.0°F (11°C), and it’s unlikely to budge much from there for the rest of the season. One new activity I’ve been enjoying this winter is riding my bike on a trainer. I put it in the living room, where I can watch inspirational bike videos on the TV and crank up the music. At normal indoor temperatures I find riding a trainer unpleasant– I sweat buckets. But if I come home and the house is, say, 45F, that’s perfect. Half an hour on the trainer and I feel pleasantly warmed up (more than half an hour, I actually have to aim a fan at myself to keep cool.) Plus, it heats up the room a little! Can’t say it’s a significant contribution, but the magnetic friction gizmo does get pretty warm. I’d guess an hour on the trainer is good for 0.5 kWh or so of heat to the house. I can’t really compare our lifestyle to theirs, but our sleeping plans are a bit similar. They mention using an electric blanket, which is also a critical part of our strategy for sleeping in an unheated bedroom. 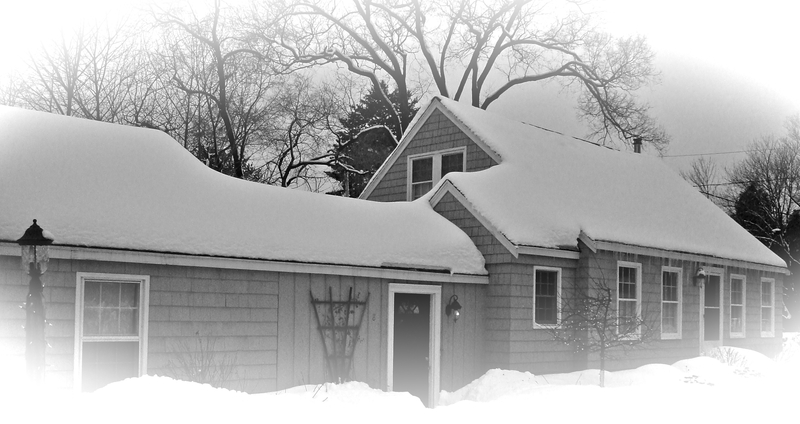 Our bedroom, though, at least has solid walls, and rarely goes down into the 30F range– while their’s must routinely go well below freezing, if not below 0F. Actually, it’s not quite clear in the story whether they use fire inside the tipi– in the video clip, Mrs. Winters (great name) says they never have heat in the tipi– but in other photos, you see her wheeling some very large pieces of firewood towards the tipi, with mention that Mr. Winters “had started a fire inside”. And in another photo, you see a small fire in the tipi. But they appear to have two tipis, so maybe one is a hang-out tipi where they have fires, and the other is for sleeping and totally unheated? It would seem considerably unpleasant to sleep in a tipi with a smoky wood fire burning inside– hard to imagine they would be doing that. Anyway, I’m hoping we might get an invitation to go visit. Also, this reminds me of an idea I had last winter: to build an igloo in our yard, and offer overnights in it via Airbnb. Also, I note a great advantage of their sleeping arrangement: they are very unlikely ever to be infested with bed bugs, which can’t survive prolonged sub-freezing temps. Yes, it’s really winter. We’ve been down below 0(F) the past couple nights, with the days not quite getting to double-digit temps. 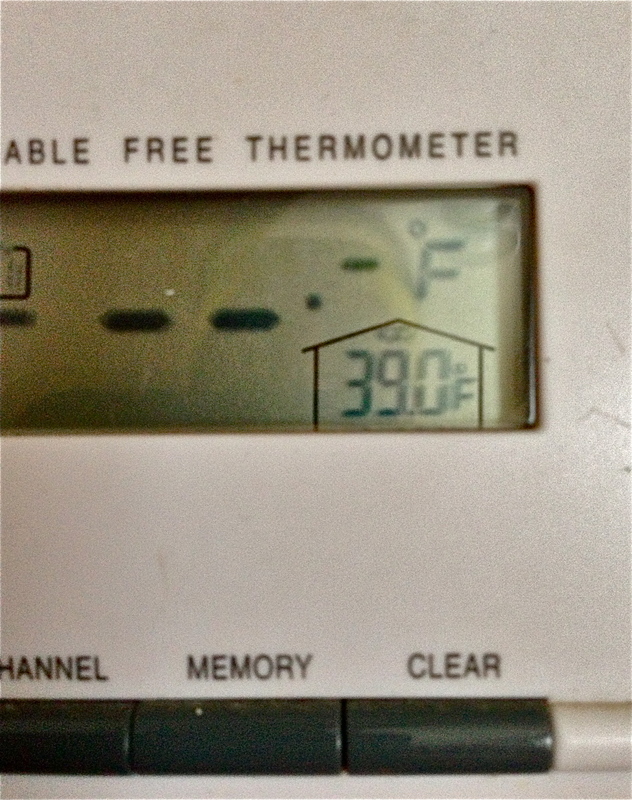 The house was 41 this morning… needless to say the wood stove is burning a bit more than usual. Still, it’s considerably warmer here than up in Quebec (where we were a few weeks ago) or central Vermont (where I’m heading tomorrow.) And it’s much, much warmer here, than, say, this town in Siberia. Those people are seriously tough. Average kitchen temperature for the winter still hovers at about 52.6F. I really like that I can pull a can of Diet Coke off the bottom self in the kitchen, and (unless we’ve really been running the wood stove) it’s already nicely chilled. And I really like that the living room at 47F is a perfect temperature for riding on the bike trainer when I get home, without getting drenched in sweat. But I will confess that even I find it annoying to have to warm up red wine for dinner. It’s kind of funny when you’re unpacking bags of groceries from the market, at the cans feel warm to the touch. Happy New Year from the Cold House! We’re just back from a few days playing touriste in Quebec City– a place that really knows how to enjoy winter. No one up there was griping about the cold– they just put on bigger hats, string up more lights, put on a smile, and go out to ski, toboggan, drink… It was also pleasant driving around in a place where snow tires are mandatory, and the proportion of SUVs on the road was dramatically lower. I think we got out of there just in time, though, as the forecast low for tomorrow night is -17F (-27F). That’s cold even to me. Back on the home front, our living area has averaged 52.8° F so far this winter. As the graph clearly communicates, the temp in here is rarely steady, either from hour to hour, or day to day. Hard to say how much wood we’ve gone through so far– maybe 1/5th to 1/4 cord. We haven’t started on the actual split wood from Treemagedon yet, still just burning the cut-up branches and other little stuff.